Sometimes I crave something specific. And these days it is much more fun for me to figure out how to make it myself than to go out and find it. Here is one of my favorite dishes from growing up: kasha varnishkes. 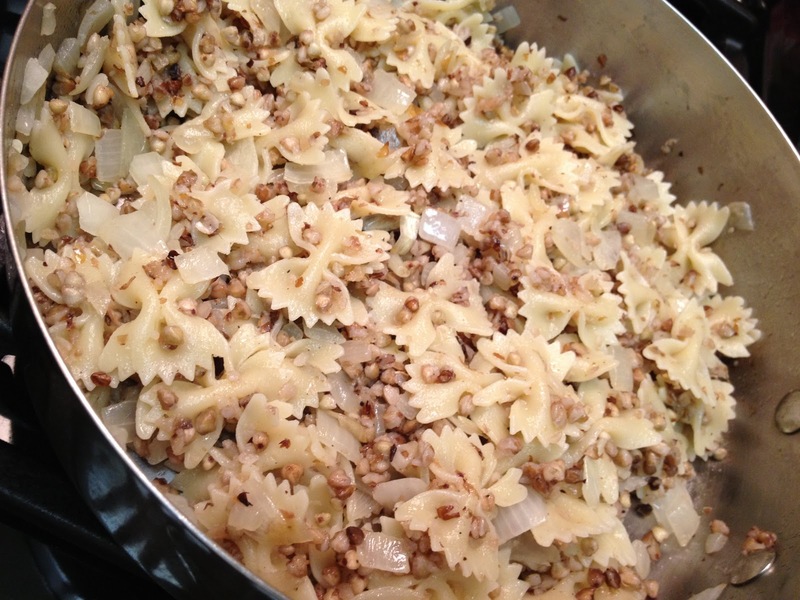 It is so simple; it is just kasha (buckwheat groats), onions, farfalle, and salt and pepper. It is a three pot affair but very simple. Boil 1 cup of water and add the 1/2 cup of kasha. Cover and simmer until all the water is absorbed. Set aside. Chop the onion and saute in olive oil. Season well with salt and pepper. Make the pasta. Add the kasha to the onions and season again. When the pasta is ready, drain it and add to the mixture. Toss with olive oil and more salt and pepper. one of my childhood favs too! although i generally prefer a greater ratio of kasha to the varnish, your version looks very enticing.